Gene editing research is moving quickly in China—researchers there have already edited human embryos, after all. But a team of scientists now have their sights set on the food supply. Ladies, gentelmen, etc., meet the first crop of tuberculosis resistant, genetically moo-dified cows. Tuberculosis has long been a problem for cattle farmers in developing countries, especially in Asia and Africa. Now, scientists from Northwest A&F University in Shaanxi, China have used a tweaked CRISPR/Cas9 gene-editing system to insert a protein that helps fight off the disease-causing bacteria. The cows developed some resistance to tuberculosis (moo-berculosis? 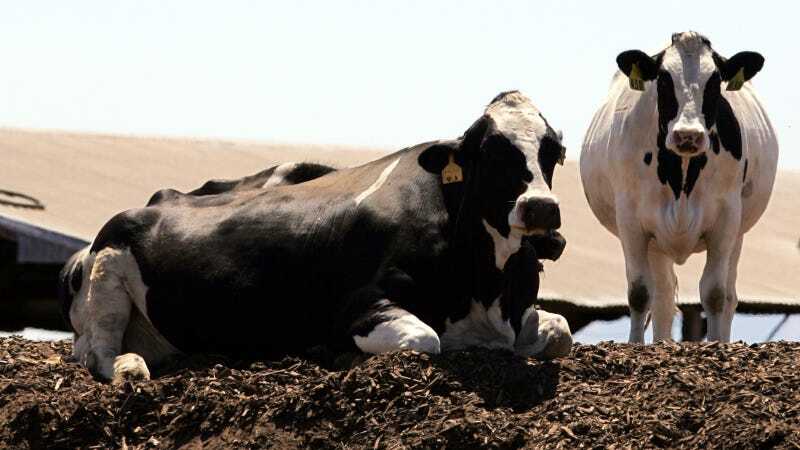 ), though US Food and Drug Administration regulations may prevent us from seeing these cows in the US for a long time. This is the first time gene editing has been used to confer tuberculosis resistance in cows, making the study a major breakthrough. CRISPR/Cas9 is the best gene editing system scientists have right now—in simple terms, it’s like scissors and a glue stick for DNA. Regular versions of the Cas9 enzyme breaks both strands of the DNA helix, which can cause unexpected changes in the DNA code, moo-tations if you will. In this study the researchers used a modified version of the enzyme, Cas9 nickase or Cas9n, which simply “nicks” a single strand and allows for more specific editing, and fewer harmful moo-tations, to insert a gene which helps provide infection resistance. The authors cut the TB resistance-conferring gene, natural resistance-associated macrophage protein-1 or NRAMP1, from a line of mouse white blood cells that you can buy yourself online, and glued it into over a thousand cow embryos, which they transplanted into over four hundred cows. This resulted in 20 genetically modified cows, 11 that lived longer than three moo-nths (ok sorry I’m done). When the researchers infected the cows with Mycobacterium bovis, which causes tuberculosis, their genetically modified creations showed more resistance than the non-gene edited cows. The researchers published their results in the journal Genome Biology today. Giving cows bacterial resistance to diseases could be a huge deal. Cows are a major cause of the impending superbug crisis, since we feed them lots of antibiotics to prevent them from getting sick in filthy, overcrowded living situations. That has caused some bacteria to evolve antibiotic resistance and turn into so-called “superbugs,” which could kill millions of people annually if we don’t slow our antibiotics use. Humans are looking into some alternatives to antibiotics to deal with the crisis. We probably won’t see these cows in the United States for a long time, however. Just a few weeks ago, the United States Food and Drug Administration introduced draft rules stating that gene-edited animals needed to be tested for safety and efficacy as if they were new drugs. However, Chuck Sattler, the vice president of genetic programs at Select Sires, told Newsweek that some cows already have tuberculosis resistance-conferring gene—meaning we might be able to breed these cows to get around the tough FDA regulations. So anyway, we just thought you should know that we can’t have nice things like cool genetically modified disease-resistant cows here in the United States.